Wolverhampton Wanderers skipper Danny Batth is pleased by his side's 4-0 triumph over Burton Albion in the Championship last weekend. The 27-year-old praised the Wolves' mental toughness and resilience after they secured a thumping win prior to the international break. Nuno Santo's side faced a 2-0 defeat at the hands of Sheffield United last Wednesday, but they came back with the right response as they scored four goals in Batth's 200th appearance for the Wolves. As a result, the west Midlands side are placed second in the Championship, and they are just a point adrift of table-toppers Cardiff City. He told The Express & Star: "Saturday answered a lot of questions. The players showed their resilience and mental toughness. It was all about having the right attitude. I think we were licking our wounds a bit after Wednesday. You take it on the chin and it's about how you react - it's only one defeat and we have to make sure it doesn't become a string of results. The clean sheet pleases me more but three points are the aim. We're proud of the result, we've done well in the past few games but we won't be sitting back and revelling in this." Following the international break, Wolves will face off against the likes of Aston Villa and Preston North End at the Molineux, and wins over both could increase their slender lead against their close competitors. Wolves did not have the best of times during their first season under Fosun International, but they have done intelligently done their business this term with the likes of Diogo Jota (loan from Atletico Madrid) and Ruben Neves adding more quality in the attacking department. 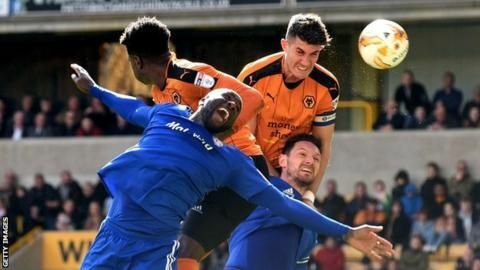 Wolves suffered double relegation from the Premier League to League One between 2011 and 2013, but they have since returned to the Championship and look determined to secure automatic promotion to the top-flight for next season.